رضایی, سبحان, آشنا, حسام‌الدین, شهابی, محمود, طالبی, ابوتراب. (1391). بررسی گفتمانی فرایندهای ارتباطی و بیانیه‌های تبلیغاتی در بمب‌گذاری‌های سیستان و بلوچستان. فصلنامه مطالعات فرهنگ - ارتباطات, 13(17), 121-162. سبحان رضایی; حسام‌الدین آشنا; محمود شهابی; ابوتراب طالبی. "بررسی گفتمانی فرایندهای ارتباطی و بیانیه‌های تبلیغاتی در بمب‌گذاری‌های سیستان و بلوچستان". فصلنامه مطالعات فرهنگ - ارتباطات, 13, 17, 1391, 121-162. رضایی, سبحان, آشنا, حسام‌الدین, شهابی, محمود, طالبی, ابوتراب. (1391). 'بررسی گفتمانی فرایندهای ارتباطی و بیانیه‌های تبلیغاتی در بمب‌گذاری‌های سیستان و بلوچستان', فصلنامه مطالعات فرهنگ - ارتباطات, 13(17), pp. 121-162. رضایی, سبحان, آشنا, حسام‌الدین, شهابی, محمود, طالبی, ابوتراب. بررسی گفتمانی فرایندهای ارتباطی و بیانیه‌های تبلیغاتی در بمب‌گذاری‌های سیستان و بلوچستان. فصلنامه مطالعات فرهنگ - ارتباطات, 1391; 13(17): 121-162. خشونت سیاسی، کنشی جمعی است که هدف و بهانه‌های دستاویز آن به لحاظ نمادین، اجتماعی و نه شخصی می‌باشد و در این میان، بمب‌گذاری، نمادین‌ترین گونة ممکن است. در همین راستا، این مقاله به دنبال آن است که با ارائه مدلی ارتباط‌شناختی، فرایند بمب‌گذاری را به‌مثابه یک واقعه رسانه‌ای مورد مطالعه قرار دهد و این نوع نگاه را در بررسی اهداف، معانی و گفتمان خشونت سیاسی عملیات‌های بمب‌‌گذاری سال‌های (1389-1387) در استان سیستان و بلوچستان ایران بسط دهد. مقاله حاضر بر اساس مدل ارتباط‌شناختی بمب به‌مثابه واقعه رسانه‌ای طراحی شده و به دنبال بررسی نحوه رمزگذاری گروه معارض در عملیات بمب‌گذاری می‌باشد. 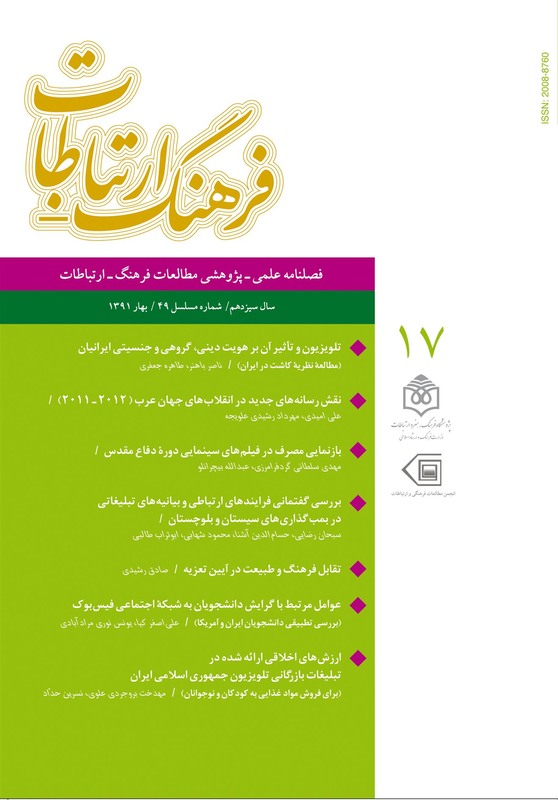 در این میان، به منظور استخراج معانی و مضامین مقوم گفتمان مشروعیت‌بخش این نوع خشونت، از روش تحلیل‌محتوای کیفی مضمونی بهره‌برداری شده تا با اتکا بر آن بتوان به کدگذاری و کشف شاخص‌های معنایی اصلی در محتوای این مقوله‌های کلامی پرداخت. Background: The study aims to explore suicide bombing attack as a media event and extends it to suicide bombing attacks carried out in the South-East of Iran. Methodology: The present work is an ideographic qualitative study, which has been designed based on the communicative model of Suicide Bombing Attack as a Media Event and examines encoding process of militant Jundallah group, an Iranian extremist Sunni group, in its suicide bombing attacks. Qualitative contextual thematic analysis was applied on the group statements to understand concepts and meanings of its political violence discourse, and explore main discursive themes and elements of these social contexts. Results: Since December 2008, militant Jundallah group entered a new period in fight with Iranian central government and it carried out five suicide bombing attacks in Balochistan province, in the South-East of Iran. The attacks were carried out in religious dates and sites related to resident Shiite minority in the region (3 attacks), and on armed forces of the central government (2 attacks). The main themes of the group`s formal statements included weakening of the central government, taking revenge, autonomy of Balochistan province and establishing a regional government, defending Sunni religious beliefs, and also considering resident Shiite minority as alien. Discussion: Political violence discourse of Jundallah group is a meaningful system, which reflects the regional position of this group as savior of Sunni Balochi people in contrast with the central Shiite government and in an international affirmative atmosphere. According to this definition, Jundallah group draws its utopia on Balochistan province which will be autonomic within Iran`s boundaries, politically; and demographically, it will have a united Sunni Balochi population; economically, it will be the center of Asian economy; and religiously, it will give complete religious freedom to Sunnis. To reach these perspectives, the group uses two strategies in carrying out suicide bombing attacks including attacking the government's representatives and agents also Shiite minority; and threatening, terrifying and persuading them to leave the region. As the last point, in order to control this crisis, armed confrontation cannot be solely adequate and modifying cultural and ethnic policies are necessitated in the region. This encourages negotiation to substitute bombing words with peaceful dialogues.